I am so very grateful that all the things we worried about (worry – repent….worry – repent….) did NOT happen. Thankfully, God has taught me HOW to correct my thinking through the example of the psalmists, the prophets and some of Israel & Judah’s good kings who proclaim how loving and good our God is. Aren’t you über-glad and grateful that we belong to a GOOD God and not an evil God? We take His goodness for granted at times and at other times fear that our allotted blessings have been used up. Here is how I should more accurately reason each morning when I awake and need to dispel the ‘Eeyore thoughts that hover: “Maria, if God saved you when you were indifferent to Him, how much more will He lavish His loving gifts on you now that you are in relationship with Him as His daughter?” We have to go from the greater to the lesser. Jesus’ substitutionary death on the Cross was a much more difficult and loving act for God than coordinating our move! Today is Fathers’ Day. The ultimate Father who delights to give His kids good gifts is who we worship as our Eternal and Holy God. When men are fathering at their unselfish best, one can get a glimpse of how God delights to cover us with His love. We just have to magnify that little speck of human love by infinity. 1) The day before we closed and moved in, we had our walk-through with the couple who built and lovingly tended this mountain home. During our two-hour briefing, they gave us the phone number of a Mexican man who clears land and has a chain saw. The next day, as we drove up the hill, keys in hand and cats in the back, we greeted the first obstacle: a fallen tree from the previous night lay across the road. It proved heavier than we could budge. We prayed and then I called the chain-saw man. 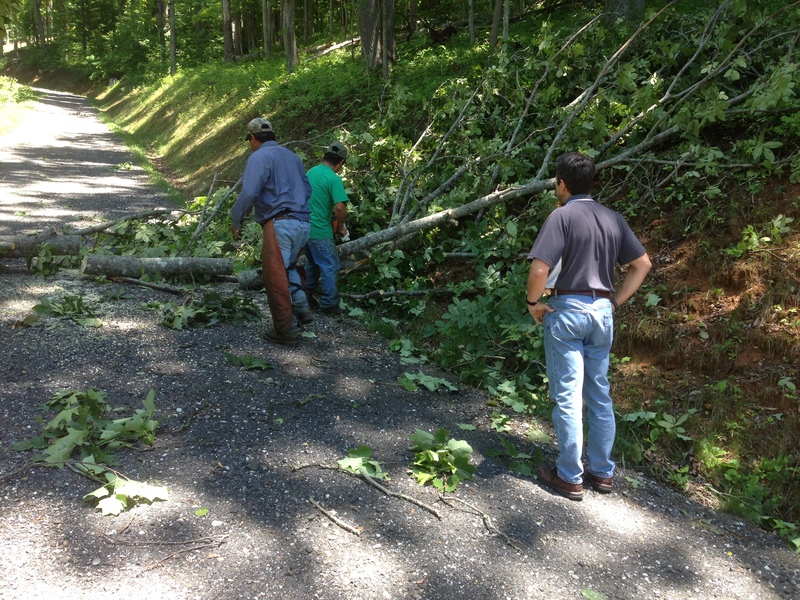 Abel & a helper ‘just happened to be’ across the highway clearing some brush and weeding for the Balsam Post Office. They arrived in 10 minutes, drove back to Waynesville to fetch their chainsaw. Within 45 minutes that tree was chopped and dispatched. Thirty dollars paid for a provision of grace long-ago earmarked for us on 14 June 2013. 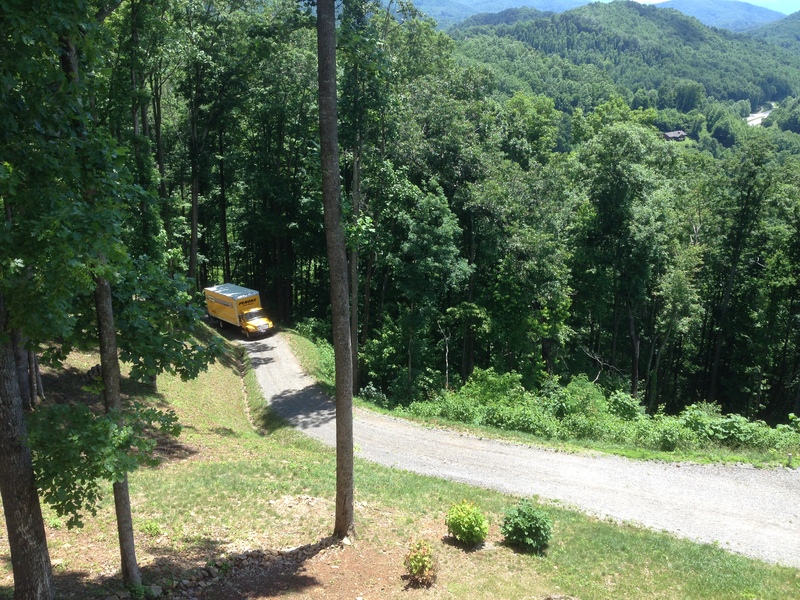 2) Our only neighbors had a truck blocking our descent on that same ‘day-before’ visit with the sellers of our house. We met Marcia as we asked to have the truck pulled in so we could get by. The driver of that truck rued the entry into our area and said the drop off and narrow gravel road with jutting rocks made it difficult to maneuver past. 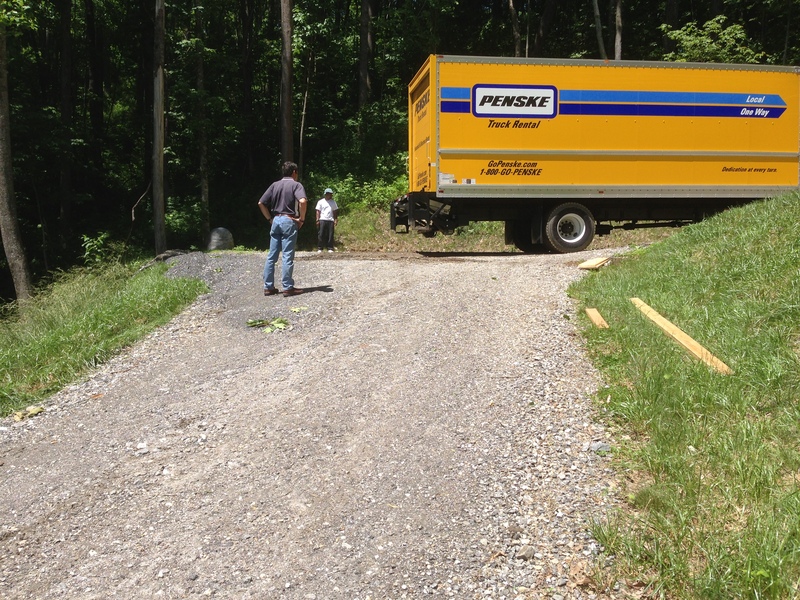 When I mentioned that a same-sized truck was coming the following day and going further UP the hill with switch-backs, he said, “God bless them!” Of course, that experience caused Mike and me to go round and round with the fear of the movers NOT being able to make it up our hill. So imagine our surprise when one of the drivers called not 24 hours later on D Day (delivery day)) and said they were up the gravel road at the fork and wanted to know which way to go. They had already passed the jutting boulder- what a blessing to see them coming up the hill! Only one glitch at the end caused some more desperate prayers, but God provided planks that the previous owner had left in the basement! Through the challenges of the past 11 months, we have seen God answer one need after another. When we’ve been in the dark, we ‘did what was at hand’ and trusted that He would provide more info on the morrow. That’s basically Elizabeth Elliot’s philosophy of ‘how to know God’s will’ – prayerfully and in reliance on Him, do the next thing at hand. Knowing me and Mike, we will still battle fears, but we have MORE examples of God’s faithfulness to refer back to. “Remember when/how God…..” are words that you all probably say a lot too. It’s good to build a track record with God – of His mighty works. Every setting has its challenges! It looks as if yours is particularly lovely – and I will pray that hurricanes and other dangerous storms will keep their heavy breath off the trees that overlook your hairpin turns. But how Provident that you had the number of the handy chainsaw man!! We are on a mesa in the Uncompahgre River valley, but have access via a miraculous system of canals and ditches to the water we need for our gardens and lawns. A dear friend of mine told me that in Feb, she and her husband received a notice that their contract with the water users assn was not being renewed because of the drought in Colorado. We average only about 7-9 inches of water a year in snow and rain, and the water users get their supply from the Gunnison River, which was diverted through a tunnel in 1905 to bring water to Montrose, for orchards and farming. Her dad bought the land in 1983, when it was divided off from a farm that had water rights. He didn’t buy any water rights at that time, but chose the contract plan instead. He planted and cherished roses and my friend is watching them die. Her dad died about 10 years ago, and her husband consoles Joy with the thought that her dad didn’t have to experience this loss of gardens. I have some lovely roses blooming, planted years ago by previous owners – maybe 40 or 50 years ago for the peonies that are a riot of pink now – and the best I can do is take her some in the morning. Guess I’d better let her know I’m coming. She is a newly retired 2nd grade teacher, who had two of our three in her classes.